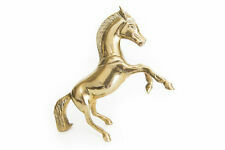 Vintage brass decorative items. Condition is Used. Includes brass bust of Shakespeare. Pair of brass boots. Brass box. h2" x w2" and three small cannons. 1KG BRASS INGOT BAR A1 plus or minus 100g. Cast from high grade brass off cuts. you will receive 1 brass bar with a total weight of 1000g plus or minus 100 grams ! Tray has an engraved floral design. 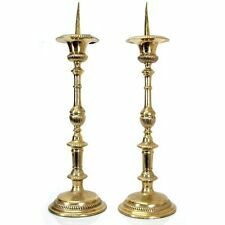 The candle holders are brass. Vintage Brass Etched Pyramid Souvenir - Rare. Condition is Used. Dispatched with Royal Mail 2nd Class. Nice traditional souvenir circa 1960/70s Etched pyramid with Egyptian scenes. Quite small item, measures 4.5 x 4.5 cms with a height of 4 cms. A well produced and executed item. Any questions please feel free to ask and please view photos for full visual description. 3 FLYING DUCKS. ICONIC DESIGN. FOR WALL HANGING. SOLID BRASS. Brass cup and saucer. Used for display only. If the item is battery or electric powered, I will test to see if working. Small solid brass shovel style spoon in good condition with a small amount of general wear. Lovely small polished brass straight sided planter. Vintage Brass Tiger in very good condition. Approx. 39cm long, 2.3kg weight. The large chestnut roaster is 17" long. 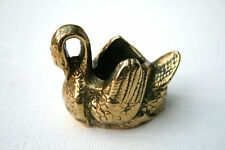 Small brass lidded trinket pot in good condition with a small amount of general wear. Pot originates from India and has engraved leaf design. I THINK THIS IS LOVELY BUT AM UNSURE WHAT IT IS! Plates, Vases, Etc. Quantity 12. May possibly have lost the tip of its tail! - see photographs. Not cleaned or polished. 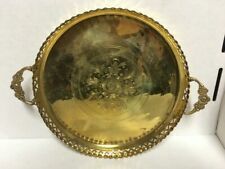 Could either be made of brass or bronze. Weight approx. 248 grams. 14 cm long by 5 cm wide. Maker's Mark - Peerage England. Good solid fake key in brass as shown. size: approx 28.5cm long. Low start, no reserve. A mid 20th century Banker's brass weight to weigh £100 in £1 notes. There is a screw lid in the base to allow compensation for atmospheric changes by adding or subtracting lead shot. Job lot of silver plated and copper plate and brass glasses, trays, pheasants and more. The items are a mix of silver plated with EPNS marks, copper plated and some appear to be brass but are unmarked. There are glasses or goblets, trays and dishes and 2x pheasants. The items are in worn to good condition with some erosion to plating and marks. The items do not come with any original packaging or boxes. 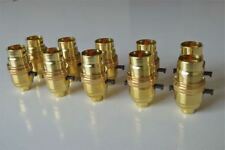 Brass x 7 Job Lot. Unit 1, Riverside, Brambleside. General Information. Vintage Solid Brass Cannon . Vintage Solid Brass Cannon .7.1/2in long. 4.in wide . good condition see photos. Model Brass Cannon. Condition is Used. Dispatched with Royal Mail 2nd Class. 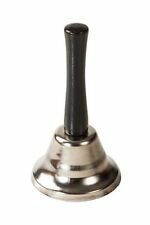 All item`s are in wonderful condition but the clapper is missing from the wall mounted bell. 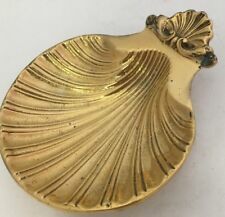 Brass soap dish, will hold a small bar, Measures 4x5 inches approx. Needs cleaning. 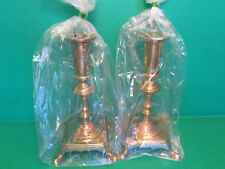 Joblot Vintage Miniature Collection Of Brass Ornaments. Condition is Used. Dispatched with Royal Mail 2nd Class. 3 X Greyhound' Dog Ornaments Solid Brass Rare Vintage Beautiful Set. Condition is Used. Dispatched with Royal Mail 2nd Class. Throwing in a couple of brass hooks and knobs. We think the pulls are for a light pull or curtain pull ??. Vintage Bugle Brass & Copper Tone Instrument Decorative Ornament Home 11.5x7"
A great vintage brass bugle, good for anyone who plays, or could be a great display item. There is no maker name on the bugle, nor any markings. In a simple shape without valves, in brass and copper tones. Measures 11.5x7". It is in fair condition; it has dulled a lot and there is quite a lot of tarnishing all over, especially by the coils in white. It is also very dusty around the coils and inside the bell, so needs a good clean. There are a couple of small dents and quite a lot of small scratches to the instrument. Vintage antique Mirror with decorative nickel plated brass stand & frame 12 1/2"
Antique/Vintage Brass Pierced Asian Moroccan Candle Holders 6"